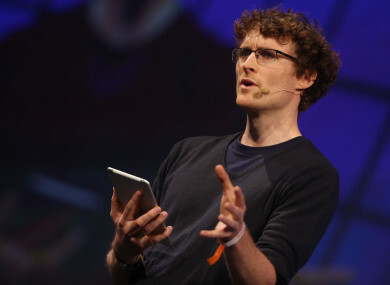 HOUSING PROTESTERS have been castigated as criminals because they don’t vote for Fine Gael, according to entrepreneur and co-founder of the Web Summit, Paddy Cosgrave. In an interview on RTÉ’s Morning Ireland today, Cosgrave was asked about why he took part in the Take Back The City protest against the housing crisis at the weekend. He later went on to criticise the national broadcaster for not highlighting issues around the housing crisis after he was asked at least five times, and did not clearly state, whether he discussed the issue of housing directly with Taoiseach Leo Varadkar when he was speaking at the MoneyConf this year. The event, which was held in Dublin in June, is organised by Cosgrave. It is attended by the world’s leading bitcoin, cryptocurrency and fintech experts. Varadkar gave an opening speech on the second day of the conference in which he said he wanted Dublin to become Europe’s tech capital. “I think Fine Gael may have underestimated the nature of this crisis,” Cosgrave said this morning, adding that protesters in the city are being dubbed as troublemakers. He said a farmer he knows was part of a group that occupied the Department of Agriculture as a form of protest, yet nothing was said about it. “It wasn’t stormed by heavy-armed police officers in riot gear, they were left peacefully there to protest for seven days,” he said, adding that Fine Gael never came out and spoke out against farmers who protest. He said farmers in this country are not called out “as criminals, as disgraceful, words used by ministers over the last week”. I think that should tell you something about Fine Gael. Fine Gael have decided, ultimately, that they think protesters in the city are of working class backgrounds, that they are from poor and disadvantaged areas and as a consequence they will castigate them as criminals – but when farmers do it, when farmers occupy farms all over this country, which they have been doing for years now, there isn’t a word out of Fine Gael and I think that should tell you something about the operating base of Fine Gael as a party in modern Ireland. The entrepreneur was asked if he had raised the issue with Varadkar personally at the event organised by Cosgrave, in which the Taoiseach was a speaker. Cosgrave took issue with the question and said he had been raising the issue of housing with advisors and a number of ministers for years. He added that he also had the housing minister over to his own home to discuss the issues. Have I raised it? I think thousands, tens of thousands of people have been raising it, the Central Bank has been raising it, the EU Commission has been raising it, the IMF raised it, The Economist have raised it. I find this reprehensible, have RTÉ covered the fact that this government has never said as much as a word about farmers in this country who have occupied farm after farm after farm, halting the sale of those farms for years now – have you pointed out the hypocrisy of that? That a group of people – believed to be from west Dublin – are castigated as criminals and disgraceful. Why? Because Fine Gael know they don’t vote for them. Over the weekend, a report in The Sunday Business Post stated that multinationals had warned government about the lack of progress in solving the housing crisis. Cosgrave said the housing crisis is not just affecting society but the economy at large, and the multinational firms have told ministers this. He said other countries in Europe have rolled out policies, policies he said are not even being discussed by the government or RTÉ. “I think that is incredibly worrying,” said Cosgrave. Cosgrave is best known for hosting the Web Summit in Ireland for a number of years. The Web Summit moved to Lisbon in 2016. When the move to Portugal was announced in 2015, email correspondence between government officials and organisers of the tech conference revealed how the relationship deteriorated after Cosgrave raised concerns about traffic management, public transport, hotel costs and WiFi at the RDS. TheJournal.ie has asked the Web Summit if Cosgrave raised the issue of housing with the Taoiseach at the MoneyConf this year. Email “Paddy Cosgrave slams FG on housing crisis, declines to say if he raised issue personally with Taoiseach”. Feedback on “Paddy Cosgrave slams FG on housing crisis, declines to say if he raised issue personally with Taoiseach”.